A few years ago, after a conversation between Sophie and her cousin Grace, we realized that when it comes to lunch, someone else’s always looks better. 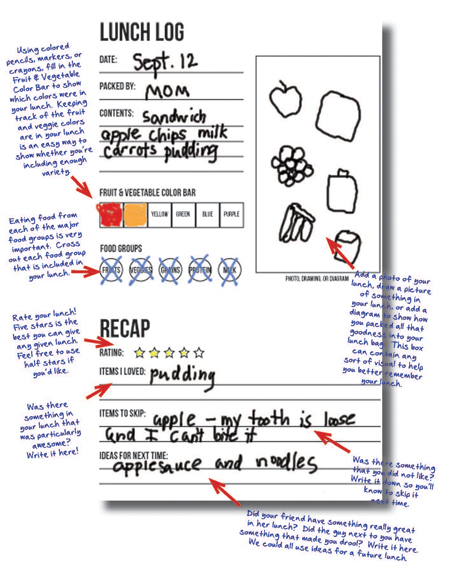 To help the girls keep track of what they liked about their own lunch, and what they spied in someone else’s lunch that looked particularly tasty, we created The Lunch Log. Like every great worksheet project, they used it for awhile until it lost its luster. Over the past two years, we’ve pulled it out and used it occasionally, usually when the lunch whining became particularly strong. Recently, we’ve been talking about tracking food again, but this time for a different purpose. For quite some time, Sophie has had stomachaches, and we can’t quite figure out what is causing her trouble. We’ve tried adding more of certain foods into her diet, cut back on other things, and encouraged her to drink lots of water. Some days are definitely better than others, but we’re not seeing consistent results. In conversations with friends, I know that there are lots of families who are having similar experiences. It’s easy to spot the connection between what you eat and how you feel, but identifying foods that are causing trouble takes some time and diligence. It is a slow and tedious process. While no worksheet has been scientifically proven to cure stomachaches, tracking what you eat and noting how you feel after doing so can certainly help to make the connections between food and the way your body feels. By writing it all down, we’re reducing some of the mystery and giving us the tools we’ll need to pay attention and find patterns. 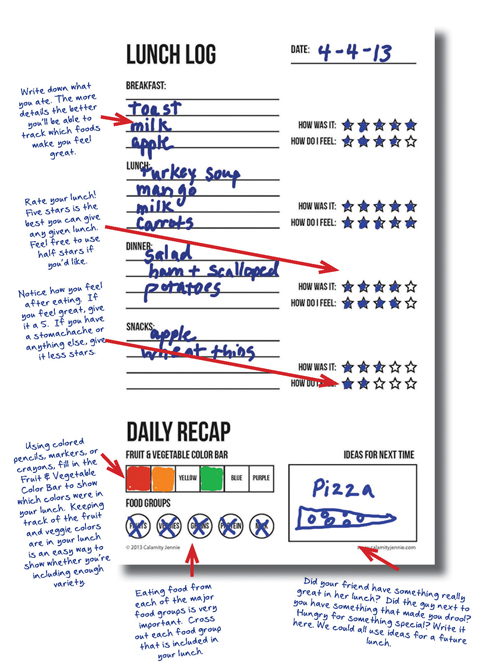 Tracking is easy – simply complete the worksheet after each meal. If your child is a pretty good reader and writer, let them do the writing and add details as needed. At the end of the day, use the Recap section as a way to identify whether there was enough variety in the foods consumed to provide the nutrients needed for wellness and growth. Overall, the goal is to create an awareness between what you eat and how you feel, so don’t worry too much about 100% accuracy. Unless 100% accuracy is very important to you, in which case I apologize that I’m using LUNCH to represent ALL FOOD CONSUMED REGARDLESS OF THE TIME OF DAY. As an adult, the connection between food (what and how much) and exercise (how much and how often) and how I feel is something that I can clearly see. The more I eat and the less I move, the worse I feel. Sometimes those feelings are physical like an upset stomach or discomfort in clothing that does not fit as well as it used to. Other times, those feelings come in the form about how I feel about myself. It seems like common sense that by eating the right amounts of good foods and exercising regularly, you are giving yourself the best possible chances for feeling healthy, strong, and comfortable in your own body. And while it is common sense, it doesn’t always come easily and it rarely happens without thought and effort. As a parent, I struggle with how to talk to my kids about health and nutrition in a way that is both age appropriate and positive. We started last year by using the Lunch Log as a way to help illustrate the different factors that go into a making and eating a healthy meal. In a worksheet format, the Lunch Log can help a kid to make sure they are eating something from each of the major food groups and getting some variety along the way. In our family, tracking meals helped the kids to understand that while they like apples and it is a healthy choice, mixing up the kids of foods and vegetables that you choose helps to give your body different nutrients. Full disclosure: they were more interested in eating something from each of the color groups so that they could use more markers, than they were with the nutrients that those foods provided. And you know what? I’m okay with that. At this age, seeking and consuming variety is a lot more important than understanding the nutritional value that each option provides. Lately I’ve noticed that we’ve gotten into a bit of a food rut, and this led to some interesting discussion about making healthy choices. The more we talked about health and wellness, the more I realized that two of the hardest parts about living a healthy life are AWARENESS and CONSISTENCY. While it is not that hard to plan out a healthy lunch, it is just one part of a day that is just one part of a week and so on. And of course, when you start to look at the big picture, the focus moves off of just food and onto the other stuff you do for yourself that helps you to feel good. Fill out a Healthy Summer Challenge Form (example below, printable page at the bottom). 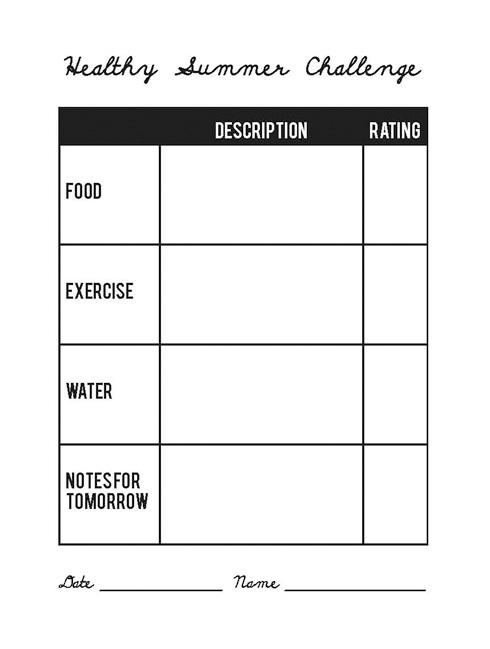 Write down the basic information in each category to show what you ate, what you did for exercise, and how much water you consumed. Give each category a rating from 1-10 (10 is high) to show how you think you did that day. Making pretty good food choices for a day could give you a 8 or a 9. Eating a bunch of junk would warrant a low number. These ratings are subjective. Add any Notes for Tomorrow to help you to identify things you might like to do differently. This gives each person the chance to reflect on the day and determine if there is a positive change to make for the next day. Add the date and the person’s name to the bottom, then drop it in a bucket. Once a week, draw a slip from the bucket to select a winner. 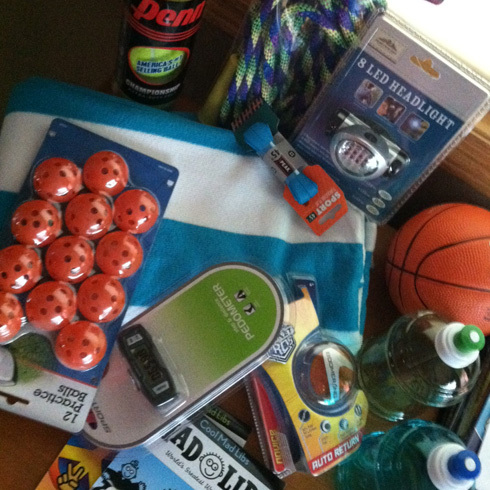 The winner gets to select a prize from the Healthy Summer Challenge Prize Pack. All remaining slips stay in the bucket, earning more chances to win. For our Prize Pack, I selected a few things that would encourage activities, stuff they’ve been begging for, and items I knew would catch their attention. Also, I made an effort to choose items that did not use food or inactivity as the reward (except for the Mad Libs, they are on the sedentary side). We’re one week into the Challenge and so far, they’re doing great. I’ve set the Prize Pack up like a display so that they can stare down the options while they decide whether or not it is worth it to fill out the form. And once they have the form in hand, they want to make choices that will give them a higher rating. And although I won’t tell them, my plan to get them to be more aware of their choices is working. Want to have a Challenge at your house? Download and print the form below. Each sheet includes four slips – print and cut the sheet into quarters. If you participate, let us know! We’d love to hear your ideas for bonus options, prizes, and how it works at your house. Grace: My mom packs peanut butter and jelly sandwiches every day. Sophie: Mmmm, that sounds good. My mom packs different stuff every day. Grace: Mmmm, I love different stuff. The lesson to learn from this exchange is this: Someone else’s mother always makes the best lunch. So, what’s a kid to do about it? Get a new mother? Unlikely. Hire a personal chef? Fat chance. Eat Lunchables every day? Nice try. Write it down! Keeping track of what is packed and consumed can help kids to learn more about their own eating habits, the foods that appeal to them, and helps to them to start to understand what they need to consume in order to be strong and healthy. It also gives them a way to tell you about the foods they love, the foods you should stop packing because they end up in the trash every day, and the good loot that other kids get in their lunchbags. 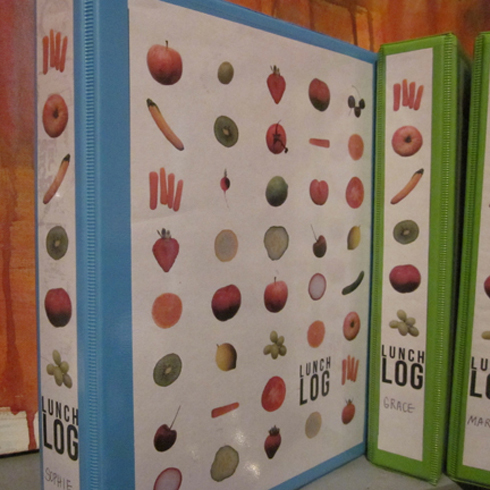 The Lunch Log provides you and your child with a way summarize and talk about the contents of each day’s lunch. The top section includes the very basics – the date, who packed the lunch, an area to list the contents, and a box for drawing/photos/diagrams. Younger kids can focus on drawing the contents of their lunch and add words as they become more proficient writers. Older kids might use this space to create food collages, write recipes used to create an item in the lunch bag, or to paste a photo. Much older kids can leave this space blank in protest of having to bring a lunch in the first place. The middle section of the page focuses on nutrition and balance by using two simple concepts – vary the colors of your fruits and vegetables each day as a way to mix up the kinds of nutrients you consume, and try to pack something from each of the major food groups in each day’s lunch. The bottom section is where the kids get to let loose and tell you how you’re doing, and how much better someone else’s parent is at doing the same job. You can use or ignore any of the comments in this section, but pay close attention to the last bit – it might give you some new ideas for lunchbag items.